63RD CONSECUTIVE SHOW IN HIS MONTHLY RESIDENCY! The Madison Square Garden Company announced today the unprecedented 63rd consecutive show by legendary musician and MSG franchise Billy Joel on Friday, April 12, 2019. 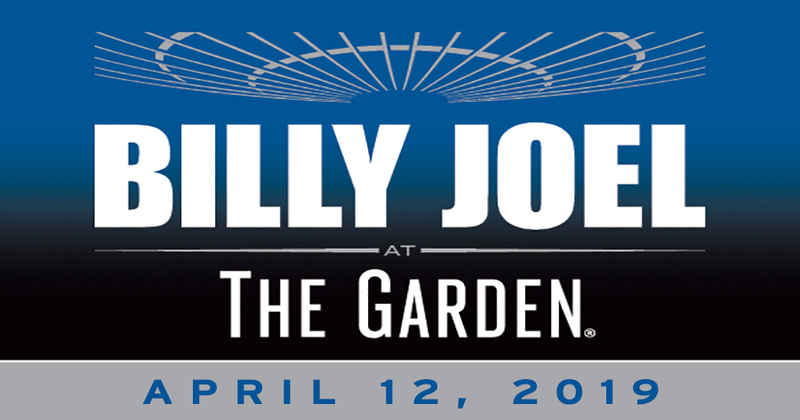 The April show is part of Joel’s residency at The World’s Most Famous Arena which began in January 2014 with him playing one show per month at The Garden. The April 2019 show will be Joel’s 109th all-time performance at The Garden. Citi cardmembers will have first access to presale tickets for the April 12 show from Monday, December 3 at 10:00AM (EST) through Thursday, December 6 at 10:00PM (EST) via www.citiprivatepass.com. Presale ticket access will also be available for the April show through Ticketmaster Verified Fan®. By collaborating with Verified Fan, we can create a safe and reliable shopping experience, and protect the fans from those who are using malicious technology to access tickets. Verified Fan registration opens on Thursday, November 29 at 8:00AM (EST) and continues until Monday, December 3 at 8:00AM (EST). The Verified Fan presale will run from Wednesday, December 5 at 10:00AM (EST) through Thursday, December 6 at 10:00PM (EST). A simple registration is all it takes to participate. For more information and to register, visit https://verifiedfan.ticketmaster.com/billyj0412. Tickets for the April show will be available for purchase by the general public beginning at 10:00AM (EST) on Friday, December 7 via ticketmaster.com and by calling Ticketmaster at 866-858-0008. Tickets will also be available at the Madison Square Garden box office on Saturday, December 8. Prices range from $65.50 to $149.50. The concerts, part of the Montefiore Concert Series, are being promoted by The Madison Square Garden Company in association with AEG Presents and Q104.3 as a media partner. Joel received The Kennedy Center Honors, one of the United States’ top cultural awards, in December 2013. He is also the recipient of six GRAMMY® Awards, including the prestigious Grammy Legend Award. Joel has been inducted into the Songwriter’s Hall of Fame and the Rock and Roll Hall of Fame and has received numerous industry awards including a TONY AWARD for “Movin’ Out,” a Broadway musical based on Joel’s music. For his accomplishments as a musician and as a humanitarian, Joel was honored as the 2002 MusiCares Person Of The Year by the MusiCares Foundation and the National Academy of Recording Arts & Sciences. The Madison Square Garden Company (MSG) is a world leader in live sports and entertainment experiences. The company presents or hosts a broad array of premier events in its diverse collection of iconic venues: New York’s Madison Square Garden, The Hulu Theater at Madison Square Garden, Radio City Music Hall and Beacon Theatre; the Forum in Inglewood, CA; The Chicago Theatre; and the Wang Theatre in Boston. Other MSG properties include legendary sports franchises: the New York Knicks (NBA), the New York Rangers (NHL) and the New York Liberty (WNBA); two development league teams – the Westchester Knicks (NBAGL) and the Hartford Wolf Pack (AHL); and esports teams through Counter Logic Gaming, a leading North American esports organization, and Knicks Gaming, MSG’s NBA 2K League franchise. In addition, the Company features the popular original production – the Christmas Spectacular Starring the Radio City Rockettes – and through Boston Calling Events, produces New England’s preeminent Boston Calling Music Festival. Also under the MSG umbrella is TAO Group, a world-class hospitality group with globally-recognized entertainment dining and nightlife brands: Tao, Marquee, Lavo, Avenue, The Stanton Social, Beauty & Essex and Vandal. More information is available at www.themadisonsquaregardencompany.com.